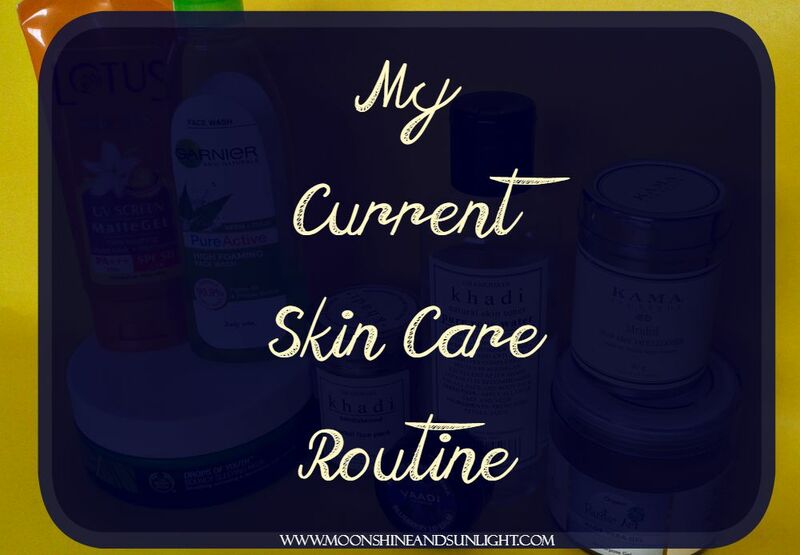 Combination skin is possibly the trickiest type of skin to take care of, and I am “blessed” with combination and sensitive skin! Yeah, the sensitive part just HAD to be there, to make things even more difficult! 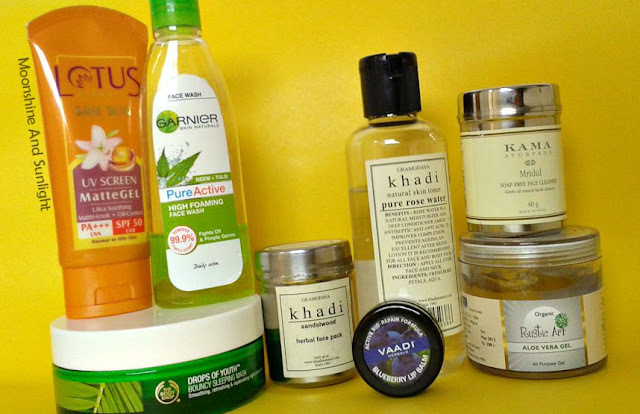 After I moved to Bangalore from Kolkata, I had to face some seeerious pimple and rash problem! But, thankfully now, I have the “situation” under control! I am dividing the routine in two parts – Morning and Night. Buckle up Sunshine!, because this is going to be a long post. 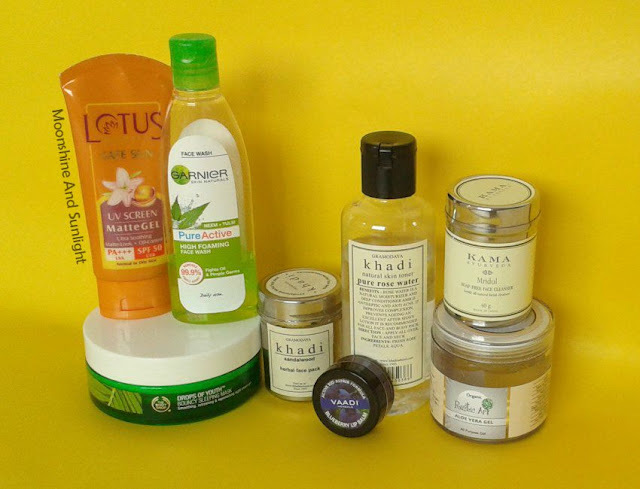 Every day when I wake up, depending on what I applied the night before, I use a face wash. Usually I use the Kama Ayurveda Mridul Soap Free face cleanser (review), every alternate day and lightly scrub my face with it. The days I do not use a face wash, I wash my face with water and then use some rose water to tone and clean my face with a cotton pad. Aloe Vera has a lot of great properties , which include it being a natural toner. It also has moisturizing properties. So every day , after washing my face or even after using the rose water, I apply a generous amount of the Rustic Art Organic Aloe Vera Gel, let it absorb. I usually stop at the aloevera gel because it is so soothing and mositurizing! ( I am loving it currently by the way ) and follow up with the Lotus Herbals MatteGel sunscreen (review). and apply a looot of the Vaadi Herbals Blueberry Lip Balm, this lip balm is so worth the money! After I am done removing my makeup , which is usually just eyeliner and mascara, with coconut oil, I wash my face with the Garnier PureActive High Foaming Neem and tulsi Face wash (review). I always follow up with the Khadi Gramodaya Pure Rose water after washing my face. Leave it on my face for a while. Once a week I go to sleep without applying anything at all. I apply the Khadi Gramodaya Sandalwood Face (review) pack for 5 - 10 minutes and I use the Khadi rosewater to make the paste. But, I have finished the pack last week and have started using the face pack I had received in my June 2015 FabBag (review). I am a very lazy girl and even this much of effort is a lot for me! so if you are very busy or just lazy like me and facing a lot of problems with pimples and their spots, then this routine just might help you out! and the best part is , almost everything is either natural or organic! If you want to try something that doesn't involve any products , DO check out my "A guide to ... For Lazy Girls" ! I tried to keep it as short and simple I could , Hope you understood it all!